1. The Roberts Creek Headwaters Ancient Forest is being considered as a new Provincial Ecological Reserve due to the significant high number of Pacific Yews growing under the Yellow-cedar canopy. Victoria-based NGO, Friends of Ecological Reserves, visited the area with ELF in early July. Further to this, BC Timber Sales has agreed to delay the selling of the block (TFL DK045) until their own Ministry of Forest Ecologist makes an assessment. There isn’t an Ecological Reserve in BC dedicated to the protection of the old-growth dependant Pacific Yew. ELF documented 340+ Yews in this one small forest, and are urging The Ministry of Forests to protect it. 340 Yews growing in an area of about 2 football fields in size, is extraordinary, and we cannot allow it be to indiscriminately logged. 2. Sunshine Coast Community Forest (SCCF) is inviting residents on a ‘Walk in the Woods’ this Thursday, August 8th to view a proposed cutblock above Halfmoon Bay. Meet at the west end of Trout Lake parking lot at 9AM. 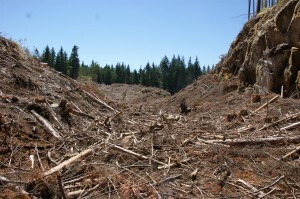 If you’ve seen ELF’s Facebook pictures of the recent logging by BC Timber Sales above Halfmoon Bay you’ve found out that 78Ha or 192 acres of forest destruction recently took place in July – see image. The big issue is that SCCF and BCTS continue to log intact, older forests that the Sunshine Coast needs to hang onto to protect diminishing bio-diversity. These forests are rich in wildlife, including elk and cougar. With habitat and forest cover loss they’ll be more negative wildlife encounters, and changes to the micro-climate as these slopes dry up. 3. Next Sunday, August 11th we’re going up to the Roberts Creek Headwaters Ancient Forest, so please join us for a guided walk and see this amazing forest 1st hand. Meet at 1PM along the B & K Rd at the powerlines. Turn off the Sunshine Coast Hwy onto the B &K Rd and drive 5 mins. up to the powerlines. Pull over to the right hand side and we’ll car pool from there. Round trip 3-4 hours. Bring water and snacks. Thank you for your continued support in helping to protect the Sunshine Coast’s older forests – the wellspring of biodiversity. For more pictures and to see and join the conversation with in excess of 1600 friends and fans click here to join us on Facebook.